A user wanted to know how to mark messages they had responded to. One method is flagging the items complete. Another is to add a custom field to add check boxes to the row so that you can mark the messages. Then you can use automatic formatting and filters to show or hide the marked messages. You can even create a custom text field and write notes about the message. Open the Customize View dialog. Right click on the header row above the message list and choose Custom or Customize View (Outlook 2007 and older) from the bottom of the menu. 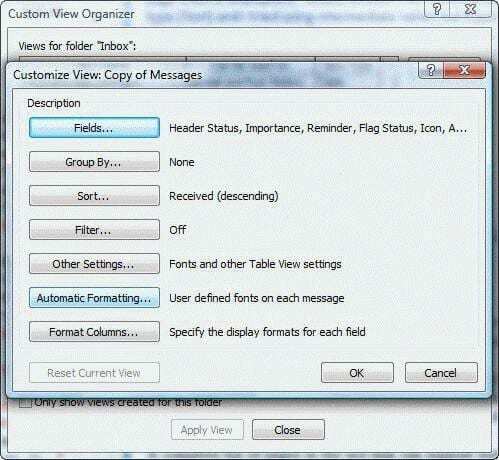 In Outlook 2010/2013, it's called View Settings. Click New Field button (It's called New Column in Outlook 2010/2013). 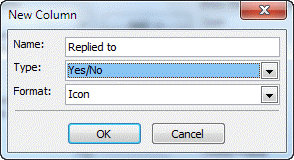 Create a custom field of the Yes/No type and add it to the view. Enable in-cell editing so you can check (or uncheck) it to mark an item. Note: The actual checkbox may not be visible in the column until you click it. In Outlook 2010 and Outlook 2013, you need to turn off Show as Conversation on View tab. When Show as conversation is checked, the field won't work when there is only 1 message in a conversation. This tutorial shows how to create and use the Yes/No field, including creating custom views or filters using the custom field. This video was recorded in Outlook 2003. The steps vary a little in Outlook 2010/2013. To create a field so you can add notes to the messages, you need to create a Text field and enable in-cell editing. Use the same steps as above, choosing the Text field type instead. The following video tutorial shows how to create a custom field in Outlook 2010 or 2013. This macro brings up an Inputbox for you type the note in then adds it to the selected message. If the field already exists, the contents are shown in the inputbox, so you can edit it or type over it to replace. Because of the way Outlook 2010 and Outlook 2013 handle Conversation group headers, you need to turn off Show as Conversation on View tab to use in-cell editing. When Show as conversation is checked, the custom field won’t work when there is only one message in a conversation. This is awesome. I love the notes field, and have wanted something like this for a long time. I should have found this sooner! You say you need to turn off Show as Conversations to add notes to a 1 message conversation. I live by Conversation View. A better alternative is to keep Show as Conversations turned on, and simply sort by a column other than Received. So if you are on a 1 message conversation, click the top of your notes field, to sort by that, which takes it out of conversation mode. The message you want to edit will still be highlighted. Add you comments, then click the header for Received, and it will go back into Converation Mode, and you will still have your comments on that message. Great article, thank you Diane. We have 5 people accessing shared mailbox but only the person who creates the new YES/NO custom field can see it and use it. I can see from previous comments below that you have suggested the same fields be set up on the other users outlook programs but this doesn't work.... presumably because each time you're setting up a 'new' bespoke YES/NO field and the server doesn't know they're all wanting the same data. How do we set up other PC/Outlooks to list the new fields and also to update if the YES/NO has been toggled? BTW, the software switched my screenshots. The "first" one has the field chooser, the "second" one, with the Copy of B... view, is from Bo's computer. I’m very impressed with the content on your site. Very helpful. I’ve a question, hope you can help. I’m using Microsoft Outlook Professional Plus 2010. I’ve created a quick step. Clicking it creates an appointment in my calendar with the email as an attachment. I want to view the calendar link next to the corresponding email. Is it possible to do it through “New Column” and “Formula”? No, sorry. You could do it using a vba macro - the macro would need to replicate the quick step then get the appointment's entry id to add it to a custom field. i was able to add a custom field to a CFG, but its not displaying the data. :( Not sure if its a user error or it doesn't support custom fields. Would there be any way to add a hyperlink (that could be followed) on a Outlook custom field? Hi Diane, great reading. If I missed this somewhere in the comments please accept my apologies. Is there anyway you know of to use a custom filed in Outlook 2016 that will display the name of the attachment file? You could do it using a macro - you'd use the basic macro at https://www.slipstick.com/outlook/email/sort-messages-sender-domain/ and look for the attachnemt name - if you have more than one attachment, the names would be entered as name;name2;name3. This would get the attachment names, skipping most signature images - then write it to the field. strAtt = strAtt & "; "
could you please guide me how to do same to several selected emails into the same folder? Thank you Diane but it does not work! please also note that i'm using a custom form and my custom field i want to change for selected emails is called "PERSON to do"
what happened when you tried it? Did you change the field name to the name you are using? This: "to help prevent malicious code from running one or more objects in this form were not loaded"
is likely due to the security bug introduced in June and fixed in the august update. Make sure all updates are installed. Hi again Diane, After i've received your suggestions, i've changed the code as foll: Public Sub DoSomethingSelectionNEWpersonTEST() Dim Session As Outlook.NameSpace Dim currentExplorer As Explorer Dim Selection As Selection Dim objProp As Outlook.UserProperty Dim strPERSON As String, strAcct As String, strCurrent As String Dim propertyAccessor As Outlook.propertyAccessor Dim obj As Object Set currentExplorer = Application.ActiveExplorer Set Selection = currentExplorer.Selection For Each obj In Selection With obj On Error Resume Next Set UserProp = obj.UserProperties.Find("PERSON") If Not UserProp Is Nothing Then strCurrent = obj.UserProperties("PERSON").Value End If Debug.Print strCurrent strPERSON = InputBox("Current Value: " & strCurrent, "Edit the PERSON field", strCurrent) Set objProp = obj.UserProperties.Add("PERSON", olText, True) objProp.Value = strPERSON obj.Save Err.Clear End With Next Set Session = Nothing Set currentExplorer = Nothing Set obj = Nothing Set Selection = Nothing End Sub -------------------- Above code works fine but only for the first one of selected messages. For the next ones, i have to write again -so, I'm afraid there is no use. Any other suggestions please? >> For the next ones, i have to write again -so, I'm afraid there is no use. what do you mean by "move it out of the loop"? could you please tell me how exactly should be my code? This sets the value before it starts updating each item in the selection. When it's inside the For Each/Next loop, it applies to each item individually. No, you can't show it in the reading pane (or opened message), at least not using a simple macro. if you need to show the value, you could use a macro to bring up a message box with the value, but it wouldn't show all the time. If you are a good programmer, you could add a pane to the right that displays it all the time. Thanks, thats what I thought, its working now, although adding a button to run this is a bit messy, any way to add this as an action that will run when I click (or right click) the note field itself ? also my rename button (or right click menu item to rename) does not work, strange right ? any idea ? i don't think you can on right click (unless you make an addin) or when you click on a specific field, but could use selection change or other actions- but it would get annoying if it came up all the time.